Our very first challenge over at Get Hippity with Ippity (GHWI) was a success! I want to thank all those entries. You are the ones who made this possible. We had 31 entries! This is fantastic! The winners for that challenge are listed in the Challenge #2 posting. Now on to GHWI Challenge No. 2. We want to see flowers, flowers, and more flowers. Your main image has to be a flower(s). Here’s my little inspiration piece. I have used the Now and Always Ippity stamp set. This is one of my favorite sets. All of my designer papers and cardstock is from Stampin’ Up! The dies are from Marianne Design. These little dies are wonderful. They make such intricate cuts. After cutting the dies I sprayed them with Pearl Glimmer Mist. I stamped one of the flower stamps three times and embossed in black. I used only three Copics: v91, 95, and 99. I cut out each one, sprayed with Glimmer Mist Pearl and then layered. 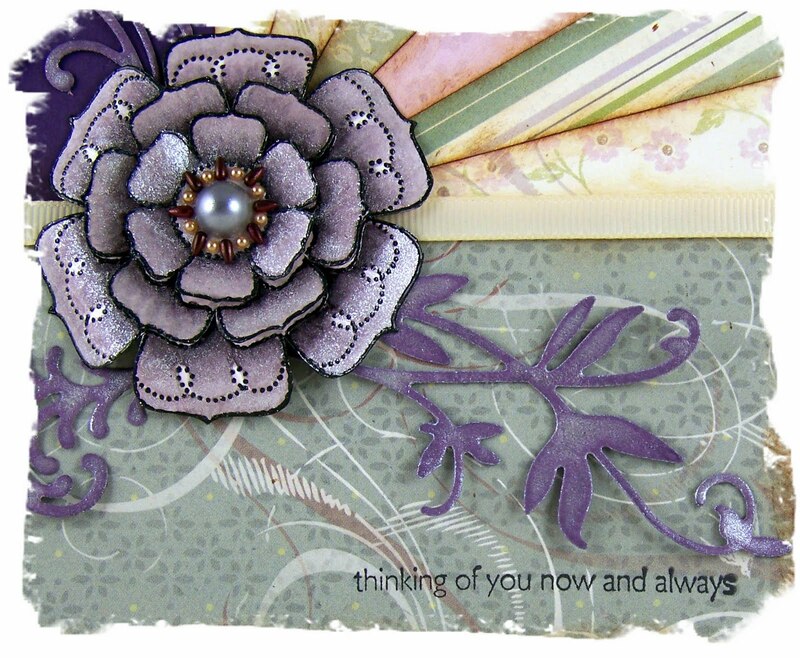 The center of the flower is a pearl flower center from Prima. 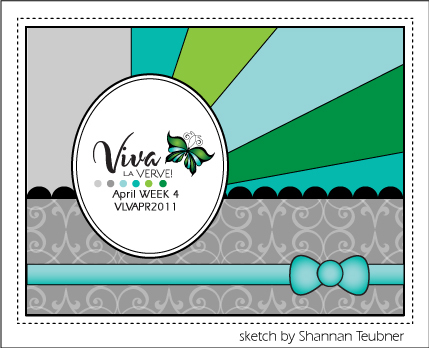 The sketch I used is from Verve on Splitcoast Stampers. Their sketches are so inspiring. Now for a little promotion! Would you like 20% off the purchase of Ippity stamps? To find the secret code you need to join one of two Ning groups. The first one is on Simply Scrapping Crafts. The second one is on The Latte Lounge. You can find all Ippity stamps here. I will be adding more stamp sets to my shop and those will be Pre-Orders. This is absolutely beautiful Aletha! I love the papers you used and the flower is so pretty! Stunning card! 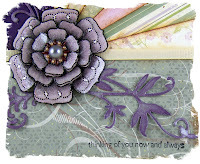 Thank you for sharing it in the Swirls & Pearls Challenge at The Crafty Pad this week! Fabulous card! 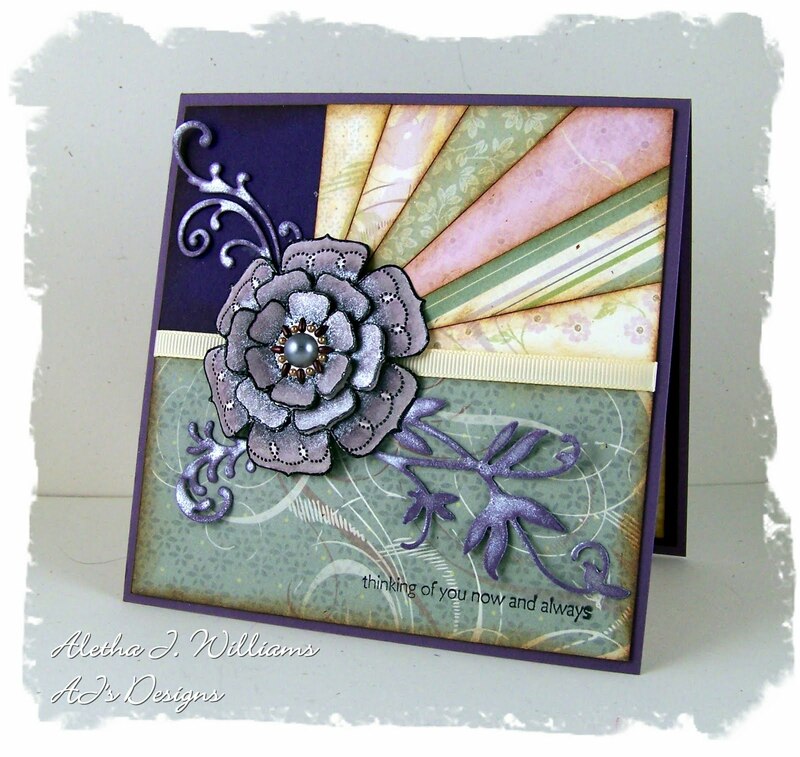 Love burst of card stock on the side with the wonderful flower. Thanks for joining us at SCH. This card is stunning. That flower is gorgeous in that shade of purple and the center pearl is the perfect touch. The vines are beautiful too. 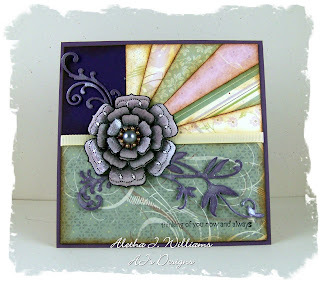 Thanks for playing along with the Sugar Creek Hollow embossing challenge. Hope to see you again soon. Absolutely gorgeous card Aletha!!! Love the colors you selected and the die cuts are beautiful! Oh this is stunning! I love the layout and that flower is just FAB! Thank you for sharing & playing along with us in The Crafty Pad – Pearls & Swirls Challenge Check back with us on Sunday to see if you’re a lucky winner & our next challenge theme. Fair winds & following seas, The Navy Wife. This is a stunning card Aletha. The flower is magnificent with all you added to it like the embossing. And your take for the layout is outstanding. Thanks for playing in the Sugar Creek Hollow embossing challenge. Hope you join us this week for the sketch challenge at SCH.